'The most magnificent plant which the prolific soil of New Holland affords is, by common consent, both of Europeans and Natives, the Waratah. It is moreover a favourite with the latter, upon account of a rich honeyed juice which they sip from its flowers'. Telopea is an eastern Australian genus of four species. Two are confined to New South Wales, one to Tasmania and one extends from eastern Victoria into New South Wales. Telopea belongs to the family, Proteaceae, which is predominantly Australian and southern African in distribution and includes genera such as Grevillea, Banksia, Macadamia and Hakea. Protea cynaroides, King Protea, is the official floral emblem of the Republic of South Africa. The Waratah is a stout, erect shrub which may grow to 4 metres. The dark green leathery leaves, 13-25 cm in length, are arranged alternately and tend to be coarsely toothed. The flowers are grouped in rounded heads 7 to 10 cm in diameter surrounded by crimson bracts, about 5 to 7 cm long. It flowers from September to November and nectar-seeking birds act as pollinators. Large winged seeds are released when the brown leathery pods split along one side. The Waratah is a spectacular garden subject in suitable soil and climate; it flowers prolifically and tends to be long-lived. Failures can usually be attributed to the effects of unsuitable soil conditions, aspect or climate. Seeds should be sown in a coarse sandy medium and soon after germination the seedlings should be transplanted into individual pots of similar soil. Fresh seeds germinate readily but the seedlings are prone to the fungal disease, 'damping off', which may be reduced by exposing the seedlings to full light, except for the shading necessary after transplanting. Propagation by cuttings is also possible. In the garden, plants should be grown in lightly shaded to sunny positions in deep, well drained soil. They need to be well watered until fully established but waterlogging must be avoided. The Waratah responds well to pruning which encourages flowering the following year, and overcomes the natural tendency of the shrub to assume a straggly shape. Some pruning is achieved by cutting flowers for decoration. It is a spectacular cut flower and lasts well in water. Flowers are usually crimson, but a rare creamy white form, Telopea 'Wirrimbirra White', has been cultivated successfully as a horticultural curiosity. Manipulated hybrids of T. speciosissima have been produced combining the grandeur of its flowers with the greater frost tolerance of other Telopea species. Hybrids between T. speciosissima and the Braidwood Waratah, T. mongaensis, have smaller flowers but are usually more floriferous with a compact shape and attractive foliage. One of these hybrids is the registered cultivar, Telopea 'Braidwood Brilliant', a spectacular garden plant developed at the Australian National Botanic Gardens. The Waratah occurs naturally in at least ten national parks in the geological formation, know as the Sydney Basin. Brisbane Water, Dharug and Macquarie Pass National Parks are among the areas where this species is conserved. Waratahs are cultivated north of Sydney and in the Dandenong Ranges, Victoria. They are grown in Israel, New Zealand and Hawaii for the cut flower trade. It was introduced to England in 1789 but cannot survive English winters out of doors except in the south-west coastal regions, and it rarely flowers in glasshouses. It is also cultivated in California. A little later artists like Margaret Preston used the bold shape of the Waratah in her hand-coloured woodcut prints [illust]. 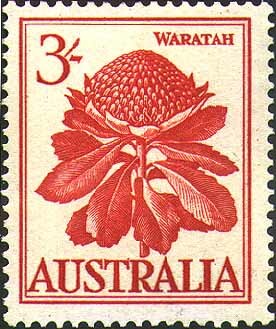 Many government authorities and community groups in New South Wales use the Waratah in their insignia, often adopting a stylised version of the flowerhead. It was depicted on the 3 shilling stamp [illust], one of a set issued in 1959 illustrating Australian flora. Margaret Stones, an Australian botanical artist then attached to the staff of Kew Gardens, London, designed the stamp. 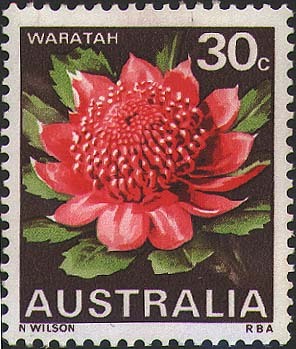 The Waratah was used again on the 30 cent stamp [illust] as part of a State floral emblem set issued on 10 July 1968. Download copyright-free illustration by Fay Davies, suitable for childrens' colouring. Look at ways the Waratah has been incorporated into applied art. Written by Anne Boden for a booklet published by AGPS for the ANBG in 1985.